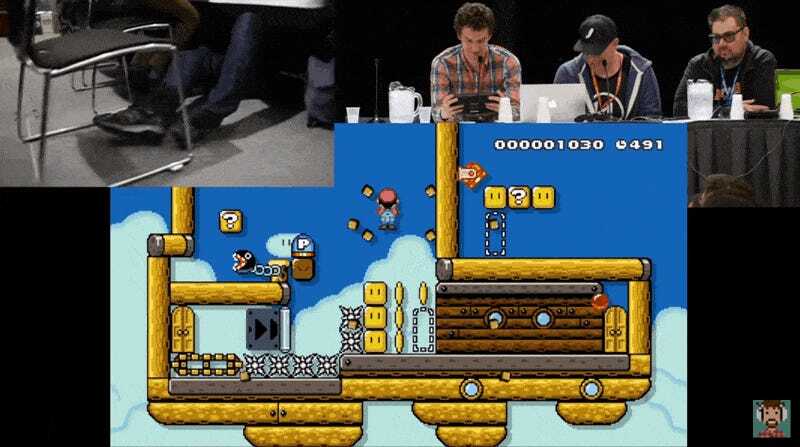 I’ve been fending off the diabolical Mario Maker creations by Giant Bomb editor Dan Ryckert for months now. Our rivalry has always taken place over the Internet, however. 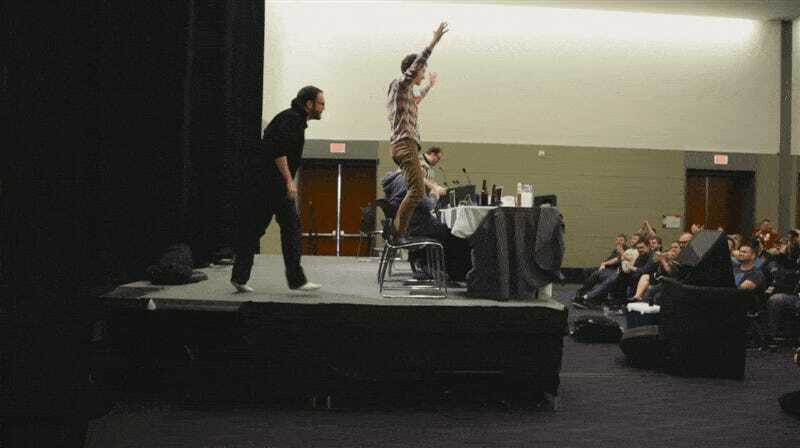 At PAX East, it was a face-to-face showdown. 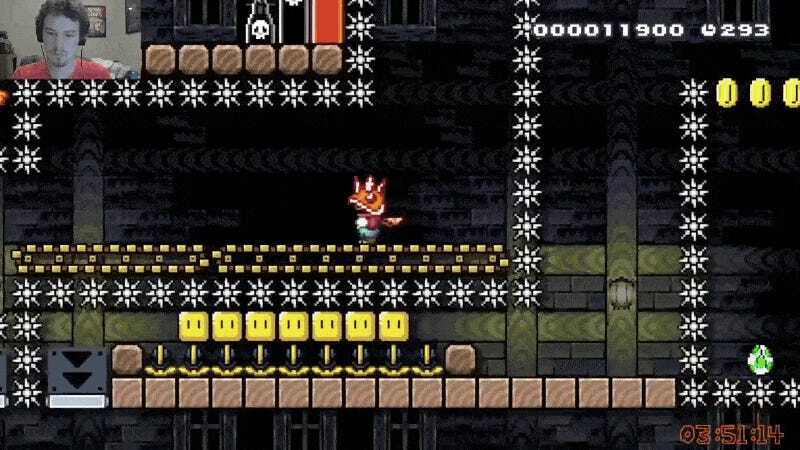 Mario Maker has captivated my attention longer than any other game, fueled by imaginative levels crafted by its players. Ryckert is not one of them. He’s a maniac with a controller who’s hoodwinked the Internet into thinking he’s clever. My takedowns of his stages were meant to prove that point...but sometimes, evil wins. Early this year, I failed to beat his final level, The Armageddan. It’s still unbeaten. That “event” ended up being WWE Raw in Rosemont, Illinois on March 6. Simpler times. We went backstage thanks to WWE wrestler Xavier Woods, who showed us around and introduced us to wrestlers who were hanging out before the show, prompting regular meltdowns by Ryckert. As long as we’re putting our cards on the table, I used to be a huge fan of wrestling during the 90s—Hogan, Macho Man, etc. This continued through the rise of WCW—my brother and I loved Goldberg—and the excellent Attitude Era in WWE, during The Rock, Steve Austin, and others. While waiting around for Raw to begin, Woods asked if we wanted to participate in a promo with him. That seemed innocent enough, right? Within moments, everything was lost. My identity shattered, my facial hair shaved. I used to think you were a nice guy, Woods. What happened? Though it took me a few months to get over things, I eventually got around to writing that book report, complete with a write-up of what happened and colorful illustrations. You can read it, I guess. Things went quiet for a while. Ryckert went back to whatever he “does” at Giant Bomb besides get drunk on 40z and re-watching Commando, while I broke the first news about the upcoming PS4K. 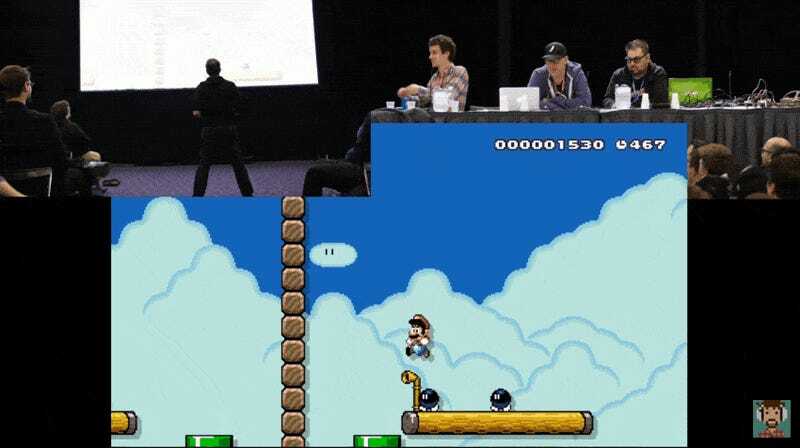 We agreed PAX East would be a good opportunity to settle this whole thing, and so we devised a panel where we’d play a set of three levels for five minutes each. An independent group of judges would determine who “won” each round. One of the three stages were produced by 8 year old Tristan, who I’ve written about here at Kotaku, Giant Bomb’s editor-in-chief Jeff Gerstmann, and Polygon editor/not-so-secret vore enthusiast Griffin McElroy. For those who couldn’t be in attendance, I asked them to record a video. Pat Baer, the official referee for the regular PAXAMANIA wrestling event, was on-hand to make sure everything went smoothly. If you define “smoothly” by getting hit in the balls, of course. The panel lasted an hour, as we traded blows, jumps, and deaths. Though I asked the creators to make sure stages could be finished in five minutes or less, neither of us got anywhere close. I’m working through them on my YouTube channel, and Monday will have me tackling McElroy’s. At the end, there was a winner, and the rivalry has been settled...for now.